The Pearl City High School Color Guard performs as part of the Marching Band's fall field production. The Guard serves to enhance the musical ideas of the band's 150+ member musicians through visual performance. The Guard combines dance and equipment work to present a visual representation of the show's themes. "Equipment" here refers to flags, often highly colorful and relating to the show's overall scheme, and the use of replicas of traditional rifles and sabres (the 'Color Guard' derives its name from the traditional military unit which presents the national colors in battle or in ceremonial settings; the flags with rifles and sabres). Often Color Guard members "spin" their flags, rifles, and sabres, combining these elements with a mix of ballet, jazz, modern, and contemporary-modern dance, in what has become a highly skilled and highly entertaining art form! The members of the color guard travel and perform with the musicians at all Marching Band Competitions, and at halftime of some football games. 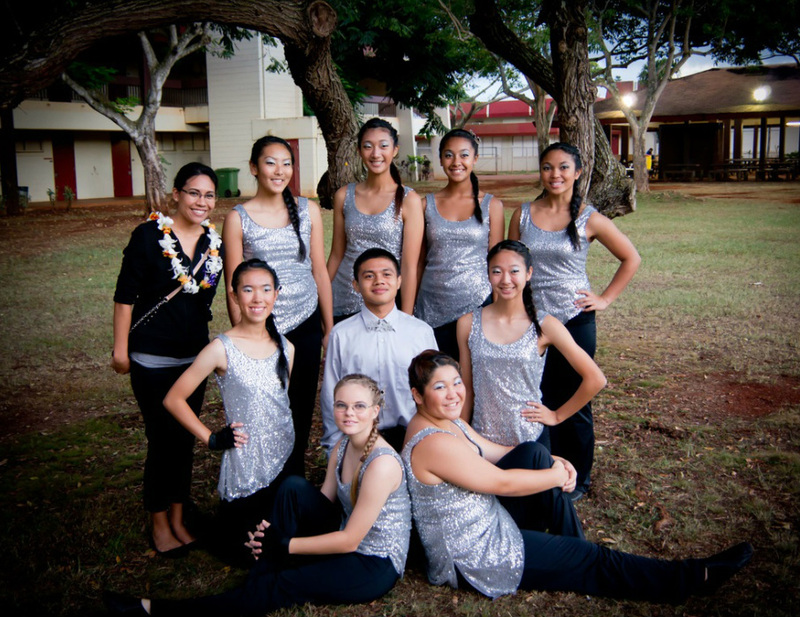 Members of the Pearl City High School Color Guard have varying backgrounds and experience, from years of dance training prior to auditioning, to absolutely zero dance experience. The Guard welcomes anyone who is interested in dance, performance, and being part of a great team to give it a try! Members of the Color Guard will be chosen at auditions. Prior dance, twirling, and spinning experience are not required, but are beneficial. All dance and spinning skills required to be in the Color Guard will be taught during the practice sessions leading up to the performances. What can I expect if I make the guard? Attendance at all rehearsals, totaling no more than 8 hours per week, and attendance at all football games and performances is a MUST. We are the most visual section on the football field or performances, and thus rely on each and every member to be at all rehearsals. Members must purchase a uniform, as well as other items including, but not limited to, gloves, shoes, band shirts. What do I get out of being in the guard? New Members just starting high school will begin the school year already knowing many members of the PCHS Band (which includes the color guard), and several other freshman, some of which may even be in the same classes. Your friendships will develop throughout the season and continue on for many years to come. You will have experiences and memories that last a lifetime. You'll get exercise, spend time in the sun, and enjoy the company of your friends, all while being involved in one of the best organizations at PCHS. You'll get to perform for hundreds of your classmates at football games, take bus trips to other high schools and competitions, knowing all the time that you have the support of older guard members to help you adjust to high school, marching band, and color guard. You'll naturally improve your time management skills, prioritization and organization skills, and obviously, your eye-hand coordination skills. Lastly, and most importantly, color guard will develop you into the performer you've always wanted to be!